Sir Jack Hobbs played his last First Class match in 1934 at the age of 51. It is a measure of the man that probably the greatest controversy in his life arose after his death, and relates to the career figures that represent a major part of his legacy. Did he finish with the traditionally accepted tally of 61,237 runs at 50.65 with 197 centuries, as Wisden will tell you, or is it the 61,760 at 50.70 with 199 centuries as maintained by the Association of Cricket Statisticians and Historians and adopted by Cricinfo? Feelings on either side run surprisingly high, but in truth it matters little of course, Hobbs being the most prodigious run scorer the game has seen on either measure. Born in 1882 Hobbs came from Cambridge. He was the eldest of twelve children. Hobbs’ father was a roof slater. With a love of cricket that he passed on to his eldest son he became a professional bowler at Fenner’s and later a groundsman at Jesus College. For Hobbs there was therefore plenty of cricket, but he was no child prodigy. He did not score a century in any form of the game until he was 18 and only from that age, when sadly his much loved father died of pneumonia, did Hobbs begin to really make his way in the game. Before Hobbs was born Cambridgeshire was, briefly, a First Class county and had a strong cricketing heritage. As Hobbs was growing up the county’s most famous player was the Surrey batsman Tom Hayward who, after WG Grace, became the second man to score one hundred hundreds. Hobbs was always at pains to make the point that he was self coached, particularly in the context of Hayward as it was sometimes said that Hayward had been his mentor, but it was certainly the case that Hayward was involved in the introduction being made at the Oval. Hobbs did nothing spectacular during his trial, but did do enough to earn a place on the Oval staff in early 1903. In those days qualifying rules were such that Hobbs then had to live in Surrey for two years to gain the residential qualification he needed to represent his adopted county. It was therefore not until the start of the 1905 season that he made his First Class debut. By the time he started his run scoring Hobbs was therefore already 22. To cite but two examples each of Len Hutton and Denis Compton had already scored more than 7,000 runs at that age. There was an excellent start to Hobbs’ career as he scored 18 and 88 on debut in tricky conditions against a Gentlemen of England side. Next, in his very first Championship fixture he scored 155 against Essex and at the beginning of June he scored another century at Leyton in the reverse fixture. By then he had also been run out six short of a century by Joe Darling’s Australians. That was the high point. As the season wore on the day in day out cricket took its toll, and whilst Hobbs never lost his place and managed his 1,000 for the season easily enough, a disappointing average of 25.82 was not a figure he was destined to repeat. By the time the Great War closed the game down for five years at the end of the 1914 season Hobbs had been playing for ten years. He was undoubtedly, at 31, the leading batsman in the country. 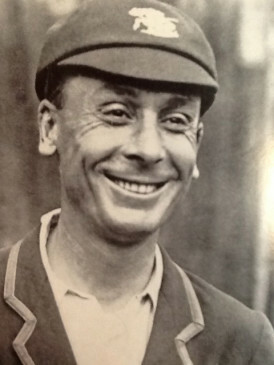 In the 1920s Hobbs’ record, statistically, improved markedly however consensus the amongst those who saw him on both sides of the war was that there was a degree of austerity in Hobbs’ post war batting, and that his stroke play lost some of the dash and brilliance that, in his early years, had marked him out as a product of the ‘Golden Age’. In a book about Hobbs entitled The Perfect Batsman harking back to the Golden Age, former England captain Archie McLaren, wrote Hobbs possesses the athletic figure so essential for the game, the loosest of loose shoulders, as his delightfully free shoulder swing shows, a pair of wrists that any batsmen might well envy, perfect temperament, and a thorough knowledge of all that is possible in batting. Test honours came Hobbs’ way for the first time when he was selected to tour Australia in 1907/08. Had all the leading amateurs been available he might not have gone, but in a 4-1 defeat for England he batted well, passing fifty three times without going on to three figures. Always a bad sailor he was very sick on the journey to the Southern Hemisphere and made a slow start to the tour. He was not selected for the first Test but came in for the second and between then and 1930 he was never left out of an England side for which he was available. In Australia Hobbs batted superbly. Even on his final tour there in 1928/29, during which he turned 47, he still averaged just over 50. He was of course an opener, and one who forged a number of enormously successful opening partnerships. For Surrey he shared in as many as 40 century opening stands with Hayward and after the war 65 with Andrew Sandham. With Herbert Sutcliffe there were 25 (15 in Tests) and 13 with Wilfred Rhodes (8 in Tests) as well 21 with other batsmen, and two more with Sandham for teams other than Surrey. As noted statistically if not aesthetically Hobbs’ peak came in the 1920s, beginning with 1925, by when he was already 42. There was no Test cricket that summer and Hobbs took the opportunity to plunder the bowling of his fellow Englishmen for more than 3,000 runs, including a then record 16 centuries. Perhaps surprisingly it was the first occasion on which he headed the First Class averages, at 70.33. He was at the top again the following season with an increased average of 77.61 although, by dint of playing seven fewer innings, his aggregate was slightly down, 2,949 as opposed to 3,024. In 1927 injury and illness reduced Hobbs’ effectiveness, although many would doubtless have been happy with his season’s work, 1,641 runs at 52.94, before in 1928, in what was an exceptionally good summer for batsmen generally, he might well have beaten his own record of three years previously. In the end he finished up with 2,542 runs at 82.00 after missing nine matches in June and July because of injury. It was in 1926 that Hobbs played the innings which defines him, for England against Australia in the final Test of that summer’s Ashes series. The match was, after draws in each of the four previous matches, to be played to a finish. England had lost all three series since the war ended and of the 15 Tests had lost 12 and recorded just a single victory, a consolation in the 4-1 defeat in Australia in 1924/25. New captain Percy Chapman won the toss and batted but England were all out for 280. They would have been disappointed with that given the conditions but the bowlers responded superbly and reduced Australia to 122-6 before a late rally saw them recover to claim a lead of 22. Enough time remained on the second day to enable Hobbs and Sutcliffe to take England to 49-0 at the close. That night there was a thunderstorm, and heavy rain fell on the Oval for hours. In those days wickets remained uncovered and when the players arrived at the ground the previously straw coloured pitch had been blackened by the rain. If that was bad news worse was to come as steam started to rise from the wicket as the warm morning started the drying process. When Hobbs and Sutcliffe resumed Hobbs privately felt England would do well to get another 80, and that was before the sun came out to accelerate the drying process and turn the wicket into a treacherous sticky. Australia had four front line spinners to exploit the conditions, leg spinners Clarrie Grimmett and Arthur Mailey, the orthodox left arm spin of Charlie Macartney and the medium paced off breaks of Arthur Richardson. Contemporary accounts suggest that all four bowled well, but Hobbs and Sutcliffe were more than equal to them. Despite Hobbs’ fears it was mid afternoon before the pair were parted at 172. The famous umpire Frank Chester described the wicket as the worst sticky I have seen, I did not give England a chance. Hobbs tactic was to take guard well outside leg stump and move towards the ball when he could see where it was going to pitch. At one point he played out eight successive maidens from Richardson, but eventually the tide turned, and Hobbs 100 and Sutcliffe’s 161 (the next best England score was an unbeaten 33 from bowler Maurice Tate) set up what remains one of the most famous victories in the long history of the game. Throughout his career Hobbs was a fine fielder, even as he got older. His reputation was made in the covers where he would run around, competently but unspectacularly for the most part. His great skill though was to lull the batsman into a false sense of security, because the genial and smiling Hobbs would, just as soon as a liberty was taken, surprise a batsman with the speed of his reactions and the accuracy of his throw. He particularly enjoyed toying with Australians, and ran out as many as 15 of them on the 1911/12 tour. In a different time or with different priorities Hobbs might also have been a successful all-rounder. He was on the quick side of medium pace with an easy action and a high arm that enabled him to move the ball away from the right handed batsman. In League cricket in the Great War Hobbs had some exceptional bowling figures, but at First Class level he wasn’t particularly enamoured of bowling. In 1909/10 in South Africa he did however manage the unusual distinction of opening both the batting and bowling for England in three Tests. There was only one wicket though, the only Test wicket he ever took, but there were more than 100 victims in other First Class matches at the creditable cost of 25 runs each. Just occasionally attempts have been made to discredit Jack Hobbs, and when they are the subject that always comes up first is his war record. The Roll of Honour amongst professional cricketers in the Great War was a long one, and as many as 75% of pre war county cricketers answered the call to arms. Jack Hobbs did not however join up, at least not until 1916 when conscription was introduced. At that point he joined the fledgling Royal Flying Corp as a mechanic. He did not leave England. Despite what is sometimes suggested there was not, following the outbreak of hostilities, a flood of volunteers filled with patriotic fervour inspired by the famous poster that, via the timeless image of Lord Kitchener pointing towards its reader, gave the stark message “Your country needs you”. Hobbs explanation for not immediately volunteering, on those rare occasions he could be drawn on the subject, was a simple one. He cited two reasons, the first being simply that he did not, for many months, appreciate the gravity of the situation. He was not alone in that. The origins of the conflict and its immediate catalyst were a long way away. Secondly, and it is worth noting entirely acceptable to public opinion at the time, was that he was a married man with four young children and a wife to support, as well as having financial responsibilities towards his widowed mother. There was also some criticism from members of Hobbs’ family who were serving, and certainly this particular episode is probably as close as he gets to having anything negative said about him. Hobbs did do war work in a munitions factory. These were dangerous places where employees spent long hours in unpleasant conditions, although the suspicion is that Hobbs’ position was probably confined to office work. Even then his hours cannot have been unduly long, otherwise he would not have been able to antagonise the autocratic Yorkshire Chairman, Lord Hawke, in the manner in which he did. Hawke was a passionate supporter of the armed services and strongly in favour of his players joining up or being otherwise engaged in the war effort, and the prospect of anything other than a complete shutdown of professional sport was anathema to him. There was therefore bound to be friction when the man who ran the Bradford League decided to encourage his clubs to employ leading professionals. He took the contrary view to Hawke, that a hard working war-focussed populace deserved some high class entertainment in their leisure time. Bradford League clubs therefore went for the best men available, and the names came no bigger than those of Hobbs and Sydney Barnes, both of whom signed for clubs in the league. Despite Hawke’s disapproval the League’s policy was successful and although Hobbs performance in terms of runs might not have been entirely in line with his employer’s expectations the number of members of the paying public he got through their turnstiles most certainly was. Hobbs’ weekend journeys to Yorkshire ended as his service with the Royal Flying Corps began, but Hawke continued to snipe at him for the rest of his days. Another man who Hobbs upset was Arthur Carr of Nottinghamshire. Carr was a decent enough batsman at county level, but couldn’t quite cut it in the Test arena. In 1926 he was appointed captain of England for that summer’s Ashes series. During the first three draws Carr only got to the crease once, scoring 13. In the fourth Test he developed tonsillitis and Hobbs took over performing creditably as a rain affected game ended in a fourth draw. There was never any question of the professional Hobbs taking over the captaincy for the historic final Test, but he was on the selection committee. Hobbs didn’t rate Carr and was one of the 3-2 majority who decided to replace him with Chapman. Carr was not happy and in what can only be a retaliatory action described Hobbs as a rotten captain. Worse was to come from Carr however when a few years later he accused Hobbs, effectively, of cowardice declaring that he avoiding playing at Trent Bridge in his later years. By the late 1920s Hobbs was a national treasure and the insult would have been a grievous one even it had been true. In fact it wasn’t, Hobbs regularly turning out at Trent Bridge and as late as 1928, when he was 45, taking a century from an attack led by Harold Larwood. Unlike his county captain the Notts Express rated Hobbs very highly. With the exceptions of Hawke and Carr Hobbs was universally respected amongst teammates and opposition alike. His calm and modest personality made sure that games in which he was playing seldom became mired in controversy, although diligent research will produce the occasional ‘incident’. Despite the calm exterior no batsman could make anything like the number of runs Hobbs did without a steely determination and there were some falling outs with the Australians towards the end of his career and, perhaps surprisingly in view of his general reputation, Hobbs was not a ‘walker’, at least not all the time. An early incident occurred in Hobbs first series against Australia in 1909. Hobbs broke his wicket with his foot before setting off for a run. The Australians appealed for a hit wicket dismissal which was, initially, going to go in their favour. Hobbs appealed however on the basis that he had completed his shot before the wicket was broken and after some debate the umpires allowed him to resume his innings. Warwick Armstrong, not as big a ship as he was to become but still an imposing figure, was particularly voluble so much so that the mild-mannered Hobbs later described him as unduly argumentative. Hobbs, a man on his own admission who was very sensitive to criticism, was dismissed next ball. Hobbs was involved in a similar incident almost twenty years later during the second Test at Sydney in 1928/29. England’s left arm seam bowler George Geary fired a delivery down the leg side at Alan Kippax. In unsuccessfully attempting a sweep Kippax’s wicket was broken, in Hobbs’ view because Kippax hit it, but in the batsman’s because the ball rebounded off the wicketkeeper’s pads on to the stumps. England appealed and Kippax was given not out, but the England fielders were furious and transferred their attention to the square leg umpire and repeated the appeal, Kippax this time being given out. Back in the pavilion skipper Jack Ryder decided to let the matter pass rather than question the square leg umpire’s jurisdiction. On this occasion it was Hobbs’ turn to be particularly vociferous. He had been perfectly placed to see what happened and led the England protests. We can be certain that his language would not have been so intemperate as Armstrong’s two decades previously, but later even Hobbs himself questioned whether he may have been a little too forceful. A final controversy came in Hobbs’ last series, the 1930 Ashes. The Master was 47 and not the batsman he once was and a young tyro named Bradman was tearing up the record books on his way to what remains a record series aggregate of 974 runs. In the third Test at Headingley the Don scored 334, so England were facing a first innings of 566 when Hobbs and Sutcliffe opened up. They raised the half century for the penultimate time but, at 53 with his own score on 29, Hobbs drove a delivery from Grimmett into the covers where the seldom remembered all-rounder Ted a’Beckett threw himself forward and claimed a low catch. Hobbs wasn’t sure the ball had carried, and he quickly asked the view of the Australian wicketkeeper Bert Oldfield who shared his doubts so Hobbs stood and waited for the umpire’s decision. To be fair to a’Beckett Hobbs and Oldfield seem to have been in a minority of two, and although Hobbs left the field immediately he was given out the Australians were none too impressed at his not having immediately accepted the fielder’s word that the catch was fair. In particular Vic Richardson, grandfather of the Chappell brothers, had a few words for Hobbs after the close of play. Whatever ill-feeling there might have been didn’t linger though. Two matches later at the Oval Hobbs’ last Test began. It started with his scoring a less than fluent 47 in England’s first innings of 405. With the assistance of 232 from Bradman and contributions all the way down the order from his teammates the Australians built up a lead of 280 before, late on the fourth day and in less than perfect conditions, England had to go in again. Hobbs was offered a place lower down the order for what was to be his final Test innings but he insisted on taking his usual place as opener. That at his cricketing home he got a standing ovation will surprise no one, but whatever irritation the Australians felt at Headingley skipper Bill Woodfull called upon his team to give three cheers for Hobbs before he eventually settled down to take guard. It was an emotional scene but, unlike Bradman in a similar situation 18 years later, Hobbs was not dismissed straight away. According to Pelham Warner he batted beautifully for a few minutes, but he did not survive to the close, facing 19 deliveries in scoring 9 before, attempting to guide a delivery from medium pacer Alan Fairfax to third man, he succeeded only in playing on. Despite his advancing years and international retirement Hobbs was back for Surrey in 1931 and for that summer and the next two he averaged over 50 each season. Only in 1934 did his powers really start to fade and he played only a dozen times, deciding that his health would not permit him to play on. He still averaged 36.70 and there was one more century, at Old Trafford in George Duckworth’s benefit match. Hobbs’ last First Class appearance was for the Players against the Gentlemen at Folkestone. His final innings brought him 18, exactly the same as his first. In 1919 Hobbs had used the proceeds of his benefit to establish a sports outfitters in Fleet Street. The business was successful and in retirement Hobbs was able to devote rather more time to it. He also spent much time in the pressbox, although his inherently modest personality and reluctance to criticise men who he had played with and against meant it was his name that attracted the demand for his input rather than the quality of the copy his various ghost writers could coax out of him. All told there were also three volumes of autobiography from Hobbs, a cricketing novel that carried his name and books on the 1932/33 and 1934 Ashes series. Hobbs did not approve of ‘Bodyline’, but Douglas Jardine was his county captain. His press reports during the series were a faithful account of the play, but little more. His book was more forthright, describing leg theory as a most venomous thing. In later life Hobbs’ enjoyed a comfortable existence. There was nothing ostentatious about his lifestyle, but his business and his writing brought him financial security. He was also a great supporter of a number of charities, both by making direct financial contributions as well as giving his time for personal appearances and items of memorabilia for sale, prizes, or auction. Medical charities seemed to be his favourites, but there were many others too. In the Second World War Hobbs was an enthusiastic member of the Home Guard, and all three of his sons fought in the war. Hobbs was, naturally, supportive of the war effort although he was caused some embarrassment on one occasion when he came into conflict with the local magistracy when he was fined for an involuntary breach of the black out regulations by his wife when she was putting their young grandchild to bed. As Hobbs aged he enjoyed good health for many years, although sadly for him the same could not be said of his wife. Ada was in a wheelchair from the late 1950s and Hobbs her main carer until her death in 1962. By then 80 Hobbs was understandably devastated by her death after 56 years of marriage and he himself lived only another year, passing away on 21 December 1963, five days after his 81st birthday. His funeral was a modest family affair but Hobbs’ enduring popularity and fame meant there was a public memorial service, at Southwark Cathedral, in February 1964.